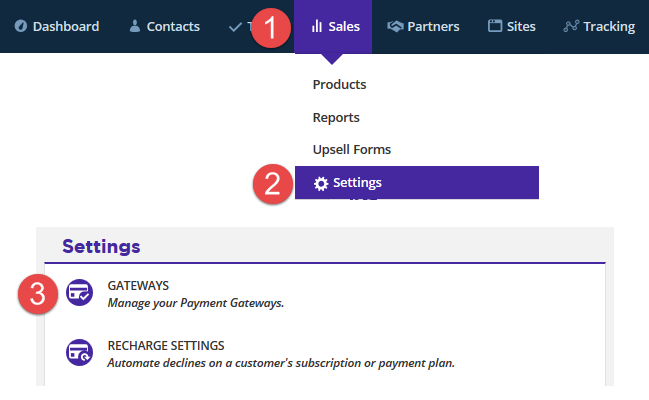 ONTRAPORT has a discrete built-in system for managing credit card collections and recharges if you sell subscription products or offer payment plans. This makes it easy to manage the frequency and duration of retry attempts when a customer’s card fails. Just set it up and ONTRAPORT will take care of it on the schedule you specify. When your customer’s card declines the Collection Settings Rules make it easy for you to customize their experience and relieve yourself of the burden of tracking it. Depending on your product or service, you can send Emails, assign Tasks for you to reach out with a phone call, and suspend or remove membership access to your WordPress site. Specify the duration (in days) of your recharge cycle. At the end of this recharge cycle, ONTRAPORT will automatically change the item's payment status to "Write Off" in accordance with standard accounting principles. This prevents you from processing the transaction. Establish a reasonable period of time for your customers to pay, such as 90 days (the default) to prevent premature Write Off status. ONTRAPORT does not automatically use other cards on file to retry failed transactions. We recommend creating a Task notification to manually try other cards. 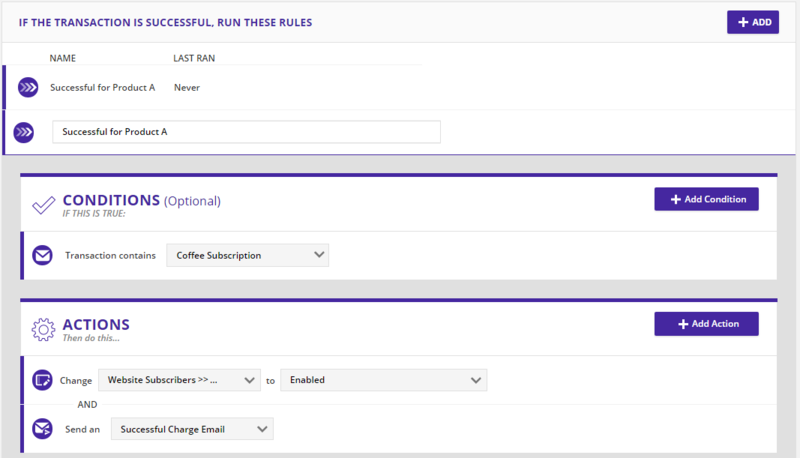 Add a Rule to notify the Contact Owner with an email. The Contact Owner is one of your staff members or the default Administrator if you have not added Users. Merge fields used in the email will have the Contact's information. Setting the Status to "Disabled" preserves the membership levels, but does not allow access to them. If the customer updates their credit card and pays, another Rule can set this same field back to "Enabled" to restore access. 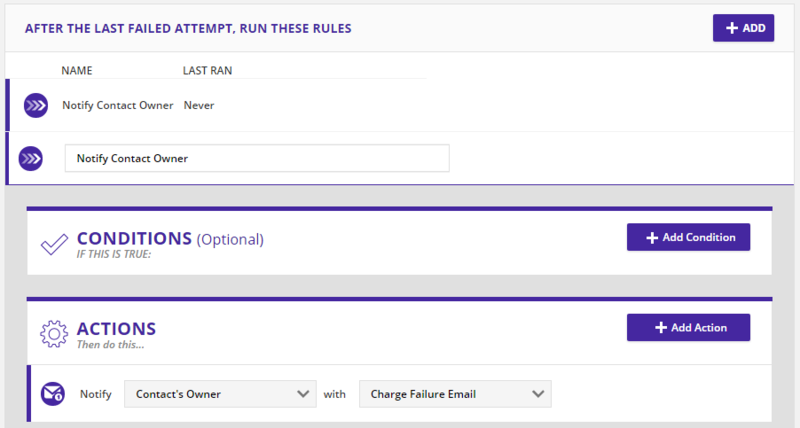 Create Rules that run for every additional failed transaction beyond the first; with the default setting of retrying every 3 days, these Rules would also run with each retry. An email to the customer in this section should instruct them how to update their credit card details. Create Rules that run after the last failed attempt to recharge a card. Note that these Rules are run after the order is in write off status. Your customer can no longer pay for this order, but you can refer them to a new order form to purchase the item again if desired, or have them contact you to settle the issue manually. A Rule in this section can also create a Task for you to review the issue and file a court case to recover the amount, etc. Many membership sites will wait until this step to delete their membership details completely as shown. This removes all information regarding their membership, and does not save the membership levels for restoration later (see step 4 for a method to preserve but inactivate membership levels). Create Rules that run if a previously failed transaction is successful. These Rules can notify the Contact Owner, restore their WordPress membership, etc. To change the credit card on behalf of your customer go to the Contact Record > Purchases tab. Locate the order in the Subscriptions and Payment Plans section and select it by hovering over it and checking the check box that appears. 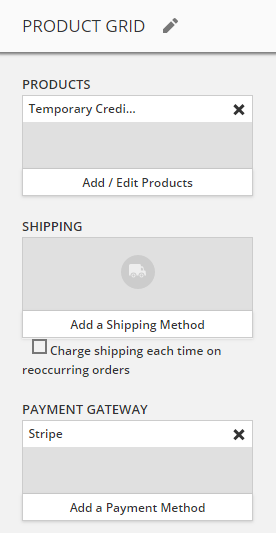 Click Edit Order in the Actions drop down box. The open order is displayed in a lightbox. Under Payment Info select Charge on the next billing date. Use the drop down next to Credit Card to select any of the active credit cards or add a new one. This change selects that credit card for all future transactions on this order. It does not affect any other subscription or payment plan the Contact has. When you’ve integrated your WordPress site with ONTRAPORT, it’s easy to send your customers login credentials so they can update their credit card in your built-in Customer Center. Just set up a Campaign or a Sequence with an email step that contains their username and password, along with a URL to their login page, and they’re just one click away from setting everything right. 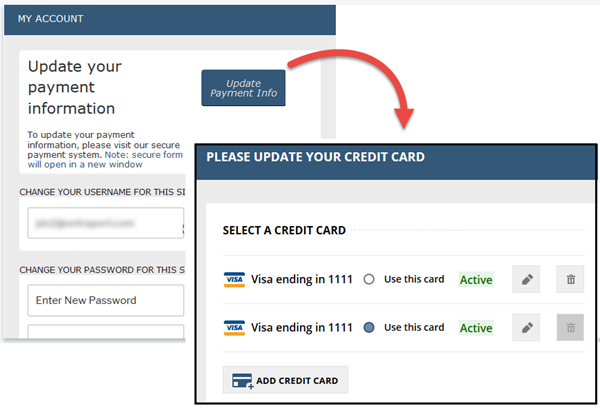 The Contact can designate the credit card to be used for all future payments on payment plans and subscriptions in the Customer Center in WordPress by selecting Update Payment Info and selecting the radio button next to Use this card. When the Contact makes this change the card selected replaces the original card used for all payment plans and subscriptions from that point forward. Note: This changes the credit card used for all existing subscriptions and payment plans. To change the credit card on a single subscription or payment plan, and leave another card active on other subscriptions or payment plans, you will have to change the credit card on the specific order, as outlined below. You can use an order form with a $0 product to update and validate the card so you know it is good for future transactions. This method is useful when you do not have an integrated WordPress site with the Customer Center. Note: Your customer may see a temporary $1 "transaction", "hold" or "authorization" notification using this method. Some cards do not allow validation with a $0 amount so we issue a temporary $1 authorization for validation, then remove it. This can trigger alerts your customer has configured. Step 4 shows how you can advise them of this. Create a new ONTRApage by navigating to Pages and clicking the New Landing Page button. Select a template or use the Start From Scratch template. Remove any other Smart Forms on the page, and add the Order Form block. Select the block for editing and then hover over the items listed in the Palette that we don't want and toggle them off. 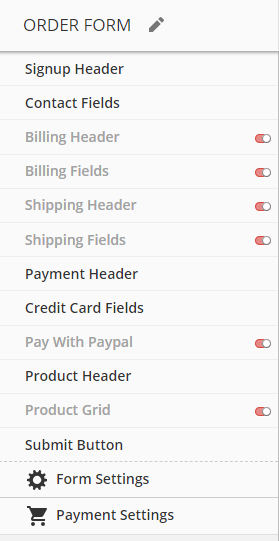 In this screen shot we have turned off the Billing Header, Billing Fields, Shipping Header, Shipping Fields, Pay with Paypal, and Product Grid displays. In the Product Grid, add a new $0 product named "Temporary Credit Authorization". Add your regular payment gateway then click Save. Edit the Product Header to tell the customer they may see a temporary $1 "hold" on their on-line account, but that they won't be charged. Save and host the form. Test the form with a test contact and your own credit card. Note: If the order has gone through the entire collections process and has the status of "Write Off" the transaction cannot be processed. 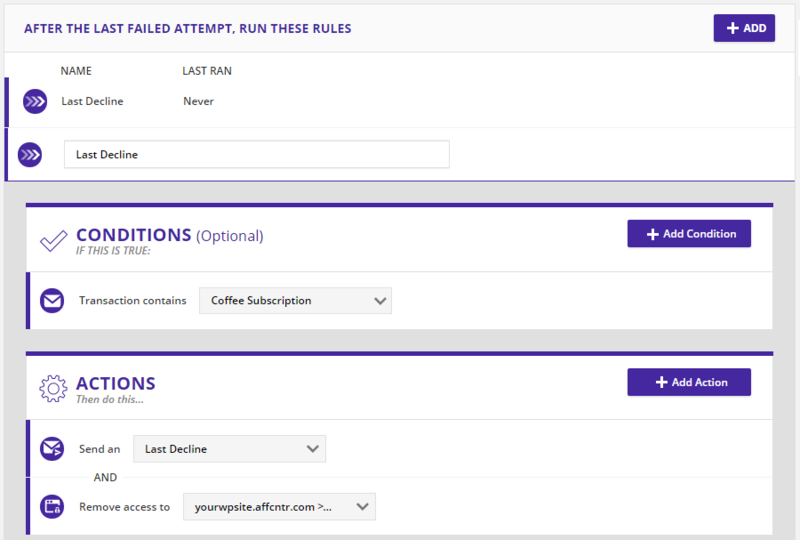 For the final "Last Failed Attempt" Rules, you can send the customer to a new order form to re-subscribe, if desired. Notify your customers of a failed credit card transaction - Create an email that notifies your customers if their credit card declines, and includes instructions on how to update their card details. Remember after the last failed attempt the order is written off, and the customer can no longer pay on that order. If you wish to give them one last chance after the write off email them a link to a new order form to re-order the item. 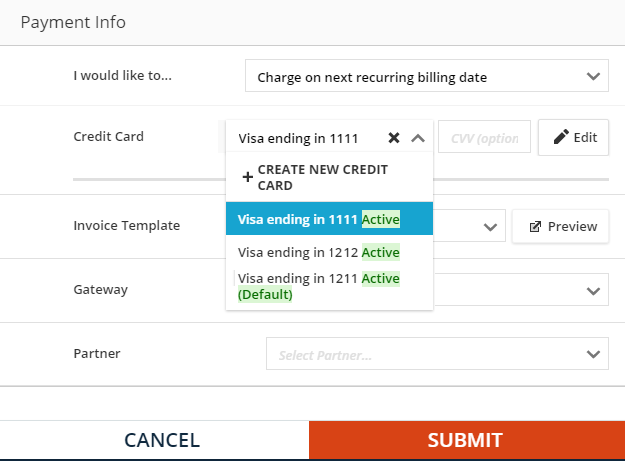 Create a Legacy Sequence with a Task step to call and collect your customer’s updated credit card information. Then attach that Sequence to your Collection Rules following the directions above. What if the customer uses a different name on the "credit card update" form from when they originally bought the product. EX. Jonathon Smith originally used Jonathon to purchase the product and now uses Jon on the update form. I'm assuming this will not update the original contact that the subscription is attached to but will then add a new contact correct? Any way around that? We index on the email address used on the order form, so the card details would be updated for the right contact record. The first name in your example would change from "Jonathon" to "Jon" if that's what he puts on the order form. If the customer updates his card in the Customer Center in WordPress it would not change his first name, as only the card details are updated. If I wanted to notify the contact themselves, rather than the contact owner, how does that change the steps above? 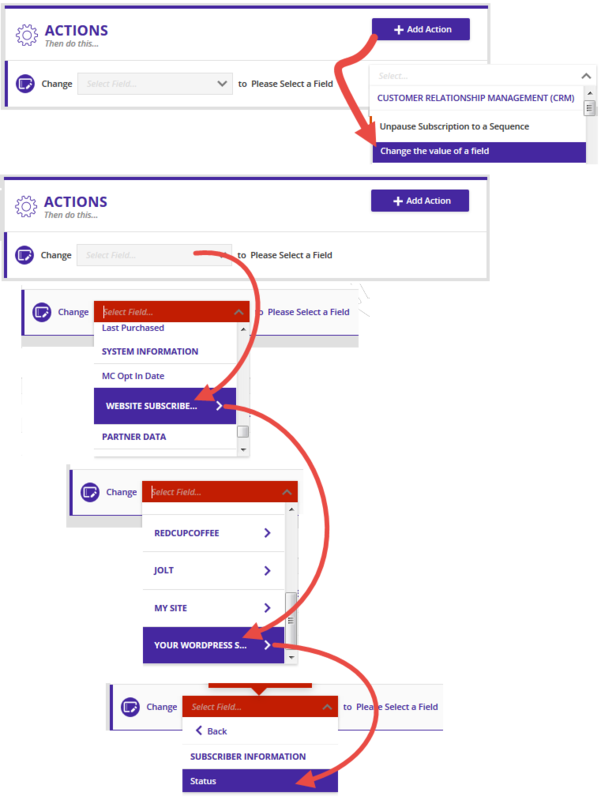 Another method is to subscribe the Contact to a "Failed Payment" Step Sequence if you want to remind them more frequently than your "Retry" settings in this section. A good fix for customers signing up for online products using cards that do not have there name. You could set up two Fields one with the User name and another with the Billing Name on the card that is applied to the product. Is that possible ontraport? Great, another 3 year old article, that sort of works, but not really. Do you guys think you could update your database? Like, Ever? I've had to call customer support 7 times this month because ALL of your articles are so outdated. It's ridiculous. Second the suggestion to have the option to toggle a single-box "cardholder name" field that has zero impact on the Contact Record's name fields and is used only to send the cardholder name through the gateway.